"Excellent staff, very friendly. Rooms are decent enough." Our staff assures the peaceful environment for the guests during their stay at Hotel Minerva ***, located in the heart of Mosonmagyaróvár. You can turn to us with all your questions 24 hours a day and we will do our best to assist you. Our hotel was built in 1974 in the centre of Mosonmagyaróvár. In 2004 the hotel was renovated. 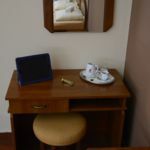 We raised the standards of our services and furnitures to make the relaxation of our guests more pleasent. There are 40 double rooms with bathroom, television. Groups can stay at our hotel, too. The thermal is 2 Km far from the Hotel. The thermal water is one of the 5 best thermal waters in Europa. The thermal spa, that is opened all year around, is real swimming paradies of our town. Our Hotel is a perfect start point for a trip to Bratislava or Vienna. The first is 25 km, and the last one is 65 km far from the Hotel. travel by cruise ship or by canoe. Having a pleasure resort in Bath Lipót can be enrolled. The border of Hegyeshalom is 10 km, the border of Rajka is 12 km far, therefor our Hotel is able to be a transit Hotel. The guests of Restaurant Galéria can taste the speciel Hungarian meals and also the meals of other countries. Our restaurant is famous about her pizzas. The terrace of the Restaurant Galéria is a pleasant place to drink a coffee or eat something. Our Restaurant can accomodate 90 people and the terrace can 36 people. 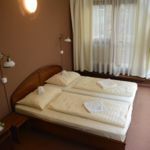 The rating of Hotel Minerva Mosonmagyaróvár is 8.8 from the maximum 10, 286 based on actual and valid guest ratings and reviews. "Ich haben mit Sohn und Enkelin nur 1 Nacht verbracht . Dennoch ,kann ich sagen das ich wieder kommen werden ." As a gift to Revngo.com bookers: You may arrive at the accommodation 2 hour(s) earlier than the general policy would allow.